We’re a month away! Buy tickets to NIAF’s New York Spring Gala before it’s too late! Get your tickets now for our 2018 NIAF New York Gala! 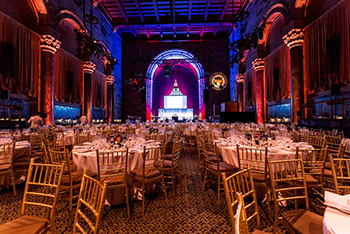 In just one month, we will be returning to the legendary Cipriani 42nd Street in the heart of the Big Apple on Tuesday, April 10. Our NIAF New York Gala celebrates the best of Italian and Italian American culture and community leaders, along with stellar food and entertainment; this year will feature a special performance by Sal “The Voice” Valentinetti, from “America’s Got Talent.” This event sells out every year! For tickets, sponsorship information, and more on the event, visit www.niaf.org/nyc or contact Andrea Bartlett at 202-939-3118 or abartlett@niaf.org. Join NIAF for our St. Joseph’s Table, Monday, March 19, at 6 p.m., at NIAF Headquarters, the Ambassador Peter F. Secchia Building, 1860 19th St. N.W., Washington, D.C. To celebrate, we will be screening “Ringraziamenti: The St. Joseph’s Table Tradition,” a semi-finalist film of the 2017 Russo Brothers Italian American Film Forum. St. Joseph’s Table reception to follow, including a conversation with filmmaker Kirsten Keppel. Bring a non-perishable food item that will benefit Holy Rosary’s Lenten Food Drive and enjoy fresh zeppole! Free and open to the public. Contact Gabriella Mileti at 202-939-3116 or gmileti@niaf.org for more information. CLICK HERE to view the flyer. Be a part of something bigger than yourself – give back to the Italian American community and donate to NIAF in our #WeAreNIAF campaign. 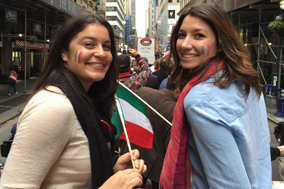 Your gift allows us to provide scholarships and grants for Italian American students, as well as continue our work in Italian cultural programs throughout the United States. Every donation counts! To learn more about what we do and how you can help, go to www.WeAreNIAF.com. Earthquakes struck Central Italy in August 2016, and again in January 2017. NIAF’s Italian American Relief Fund provides relief for the victims and helps to rebuild devastated areas. The Italian American community’s heartfelt response has been amazing. You can be part of it. All donations, large or small, are welcome and appreciated. NIAF is working with local Italian authorities in Amatrice and has begun funding, in collaboration with Ferrara S.p.A., to rebuild Amatrice’s school, which was destroyed in the earthquakes. For more information, go to: http://italianamericanrelief.org/. You can support the work of NIAF at no cost to you! Simply, go to http://smile.amazon.com/ch/52-1071723 and select the National Italian American Foundation as your charity of choice. The AmazonSmile Foundation will donate 0.5 percent of the purchase price from your eligible AmazonSmile purchases to NIAF. AmazonSmile offers the same selection and low prices as Amazon and customers can still use their Amazon account, the only difference is customers are now also donating to a great cause! For more information about NIAF and its exciting benefits, visit www.niaf.org/join. NIAF members, don’t forget to take a look at the money-saving discounts and exclusive deals all of NIAF Corporate Sponsors offer to NIAF members through your NIAF Membership Portal at www.niaf.org/my-niaf/. Participate in NIAF’s Facebook community! Like NIAF? 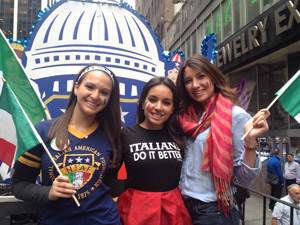 Then “like” NIAF’s Italian American, pride-studded, Facebook page to be a part of our online community! And those of you who already follow us, grazie for your support! NIAF on Facebook is a rapidly growing online community with everything but your Sunday dinner table — news, views, recipes and trivia. 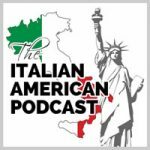 Anything Italian, Italian American or NIAF, it’s there! Plus, contests, giveaways and free tickets to shows, concerts and events across the country! Join us at www.facebook.com/niaf.org. The Italian Cultural Institute of Washington, D.C., is offering a five-week course on Italian Regional Cuisine, hosted at NIAF headquarters! 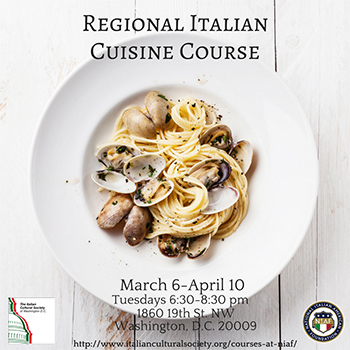 This course begins tomorrow, March 6, and takes place every Tuesday through April 10, 6:30-8 p.m. You’ll explore the recipes and history of classic Italian dishes, as well as taste them! There’s still time to sign up! Learn more here: http://bit.ly/2EG1Fai. Don’t miss the Italian Film Festival USA, taking place in major cities across the United States. 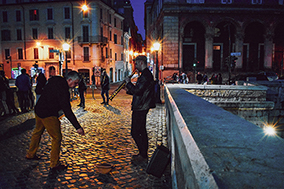 Beginning April 2, the film festival will take guests on a “cinematic tour of Italy” with various screenings from from Chicago to Kansas City to Pittsburgh. Free admission; to find film screenings near you, click here: www.italianfilmfests.org. Join the Washington, D.C. chapter of the National Organization of Italian American Women (NOIAW) for an exclusive presentation “First Ladies Throughout History,” on Thursday, March 8, at 6:30 p.m. 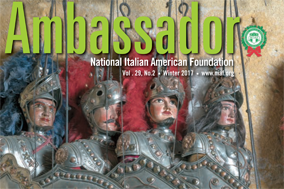 The event, which will take place at Via Umbria in Georgetown, will be led by NIAF Vice Chair of Cultural Affairs, Anita Bevacqua McBride, Executive in Residence at the School of Public Affairs at American University, and former Chief of Staff to First Lady Laura Bush. For more information or to RSVP, click here: http://conta.cc/2C2cfaP. For all other NOIAW regional events, click here: http://bit.ly/2BZEqqV. 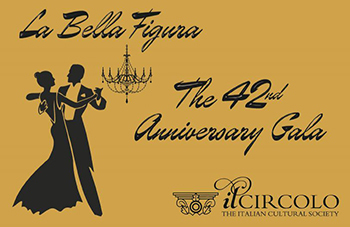 Join Il Circolo: The Italian Cultural Society for its 42nd Anniversary Gala on Friday, March 9, taking place in Palm Beach, Fla. The event will honor Italian Americans including Franco Harris, Adriana Trigiani and Carlos de Antonis, in an evening of cocktails, dinner and dancing. For more information on tickets, click here: https://www.ilcircoloflorida.org/Gala. 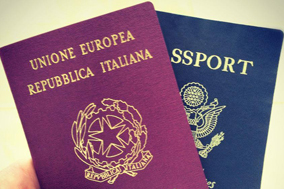 Le D.I.V.E., Donne Italiane che Vivono all’Estero (Italian Women Living Abroad), a nonprofit organization in Washington D.C., will host a black-tie benefit on March 10, at 6:30 p.m. at the Embassy of Italy. The event will fund awareness of domestic violence against women. To purchase tickets or for more information, contact Antonella Discepolo Chiancone at 301-875-2612 or via email at antonietta.chiancone@medstar.net. Join Casa Italiana Zerilli-Marimò on Wednesday, March 7, at 6 p.m. for a panel discussion on the Italian election results, which will be taking place that week. For more information or to RSVP, click here: http://bit.ly/2CqFkbS. 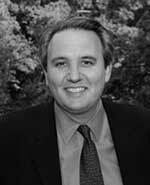 Join Stony Brook University’s Center for Italian Studies on Wednesday, March 28, at 2:30 p.m. for a special presentation with John Phillips, former Ambassador of the United States to Italy. During the presentation, guests will have the opportunity to meet Phillips and listen to his experiences of years of diplomatic service. For more information, go to: http://bit.ly/2Ev5trx. The Frist Center in Nashville is featuring a new, exclusive exhibit, Rome: City and Empire. The exhibit includes more than 200 artifacts from the British Museum’s collection of Roman objects, telling the dramatic story of how Rome grew from a cluster of small villages into a mighty empire. For more information, go to: http://bit.ly/2rKVjkV. Join Uplifting Journeys, an immersive donor education program that uses living case studies in locations around the world, on its 2018 trip to Sicily, April 23-27. Sicily, which was NIAF’s 2017 Region of Honor, offers not only an incredible cultural experience, but also the perfect opportunity to learn about Sicily’s social issues and how the region is preserving its unique heritage. For more information, go to www.upliftingjourneys.com. Congratulations to NIAF Vice Chair International John F. Calvelli on being recognized by The Picture House Regional Film Center in Pelham, N.Y. this past Friday, March 2. Calvelli was honored with the Harold Lloyd Commitment to Community Award, in recognition of his support of The Picture House, as well as for so many other causes and organizations over the years. 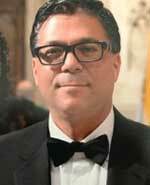 Congratulations to NIAF Board Officer Nicholas R. Caiazzo, who was recently honored at The Cathedral Club of Brooklyn’s 118th Annual Anniversary Dinner in December. The Cathedral Club of Brooklyn’s honorees are recognized for advancing Catholic interests, promoting the moral improvement of its members, and fostering the Catholic spirit in their communities. Alitalia is excited to announce that it will operate three direct flights to and from Rome and Los Angeles in the winter season! Flights will depart every Wednesday, Friday and Sunday at 10 a.m. from Fiumicino and will land in Los Angeles at 2:10 p.m. (local time). Flights from Los Angeles will depart at 4:10 p.m. (local time) and will arrive in Rome Fiumicino at 1:10 p.m. the following day. Flights to Los Angeles will be operated with 293-seat Boeing 777 aircraft, configured in three-classes of service: Business, Premium Economy and Economy. During the 2017-2018 winter season, Alitalia will connect Italy to four destinations in the United States: New York (from Rome Fiumicino and Milan Malpensa), Boston, Los Angeles and Miami (from Rome Fiumicino). To search Alitalia special offers and to book your travel, click here!